As with many of today's online retail marketplaces, shopping on eBay can be overwhelming. With over 1.1 billion items for sale across almost every category imaginable, users can get lost pretty easily - especially when thumbing through countless pages on a mobile screen. It's an issue the company acknowledges and has long sought to fix. 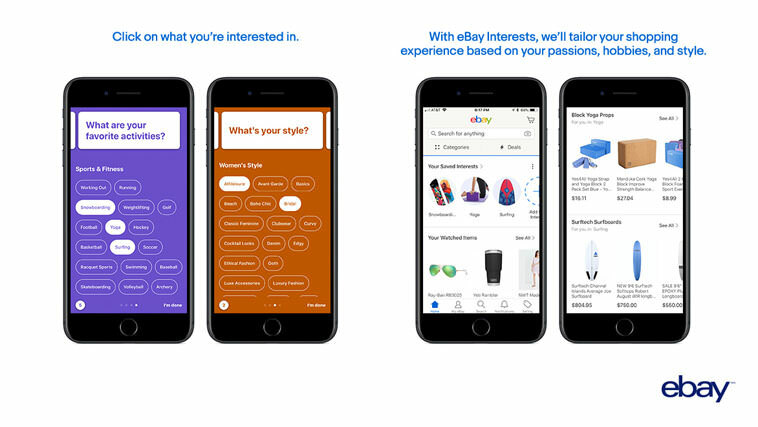 Now, with a brand new feature called "Interests" - launched this May - eBay aims to help mobile users more easily find the products that match their passions and preferences. The new personalization tool walks users through a customization experience on eBay's mobile app. Clicking on "What Are Your Interests?" brings up a short questionnaire covering a number of categories. Shoppers then declare their interests - such as favorite sports teams, fashion styles, movie genres, gadgets, and activities - by checking off boxes within each category. eBay combines this information with data pertaining to previous searches and purchases and uses it to generate a customized homepage filled with tailored product recommendations unique to every single customer. Shoppers can browse items in their selected interests, and edit their choices at any time from the home tab on the mobile app. "Today, people want shopping to be tailored to their unique interests and needs. With over 1 billion listings, from cars to sunglasses, our goal is to help shoppers easily discover things they love while removing from their experience items that aren't relevant to their personal tastes," Bradford Shellhammer, eBay's Senior Product Director and Head of Browse, Personalization & Engagement, told FierceRetail. "Shoppers can now browse and be inspired by a store built just for them, based on what they're actually into." A big part of the strategy behind Interests, Shellhammer explains, is as much about keeping consumers engaged with eBay as it is about surfacing items they're most likely to purchase. "Engagement for us means the customer doing the next step proactively," he says. "If that means buying something, great, but we're fine if they're just browsing [...]. We just want people to keep going on the journey." eBay has become more and more strategic about utilizing data to power customer experience over recent years, and the launch of Interests speaks of the company's commitment to double down on personalization efforts. Recommendations used to rely heavily on analyzing past purchases. Now, they're just one piece of the puzzle, as eBay factors in other information such as location, engagement patterns with specific items and categories, clothing sizes, and of course what users manually indicate when setting up Interests. "Much of what this team's work is doing is stepping back from personalization efforts of the past, which have been all about trying to get you to buy something based on what you were looking at recently," says Shellhammer. "The new strategy is focused more about not getting it wrong, which means pulling enough of the stuff that is irrelevant out of the way so that you keep exploring, because eventually you'll fall in love with something. We believe that firmly." Shellhammer looked beyond the ecommerce world for inspiration when developing Interests. Spotify's "Discover Weekly" personalized playlists, for instance, was a key influence - as were the questions Apple Music asks users about their music tastes when designing the Interests questionnaire. "We want you to tell us what you like, let us look at your behavior, and get you into your own personal store," he said. Combining existing user data with information provided directly by individual customers is a clever move to deliver a better and more personalized experience. Many retailers today put a lot of faith in AI (artificial intelligence) programs to figure out what consumers want and need, and it can often fall short of the mark. Far better, perhaps, is to actually ask customers themselves what it is they want and don't want, and then apply some AI to supplement what is already known. "Our shopping experience should be as individual as each shopper on eBay," says Shellhammer. "By asking people to tell us a little bit about their interests, we're delivering a personalized store built around the things you care about most." Interests could well help eBay better compete with rivals like Amazon, as consumers may be less inclined to visit competitor apps and websites when eBay is already compiling everything they're interested in neatly and intuitively on a customized home screen. The feature also takes advantage of eBay's unique inventory - such as niche collectibles, antiques, and designer clothing - made available by smaller merchants, much of which is unavailable on rival sites. Moving forward, Shellhammer confirms that eBay will continue improving recommendations for individual shoppers the more they engage with Interests. "We will evolve the themes based on how our passionate communities of buyers shop," he said. "Personalization will play an increasing role in the entire eBay experience, from what is recommended on the home page to how we interact with our buyers." Interests is currently available in the U.S. for iOS and Android. eBay plans to roll it out to new platforms - including mobile web and desktop - in the coming months, as well as further markets around the world. You can hear James Meeks, eBay's Head of Mobile, speak at Mobile Next 2018 this September at the Omni Rancho Las Palmas, Rancho Mirage, CA.